Trick or treat? How creative is Halloween packaging? It’s that time of year again when brands and retailers show what horrible, creepy, disgusting ideas they’ve dreamed up to entertain us at Halloween. Well don’t expect any surprises. Witches, ghouls, skeletons, pumpkins and dismembered body parts are trending yet again, and just like every year food and drinks and their packaging will be employing the usual (super)natural colours of black, green and orange. These are obviously codes for the night/death/witches/poison/slime and everyone’s favourite Halloween symbol: the pumpkin. Kids, the main target group for all this deliberately unappetising fare, can have a holiday from health food as they load up their ‘trick or treat’ swag bags with sugar-loaded witches’ finger biscuits, jellied eyeballs, candied skulls and, according to the menu in Fortnum & Mason, a milk chocolate exploding toad. Now there’s something I’d pay to watch. Given that the whole point of the exercise is to dare us to eat the apparently inedible, most packaging tends to offer big windows so we can see just how vile the products really are. Having ticked that particular box the majority of brands seem content to leave it there. Perhaps there’s a half-hearted attempt to pretend that the strawberry filling is Dracula’s blood, but very little creative energy is expended really engaging with the occasion to promote brand values. But back in the world of packaging examples of excellence are hard to find. 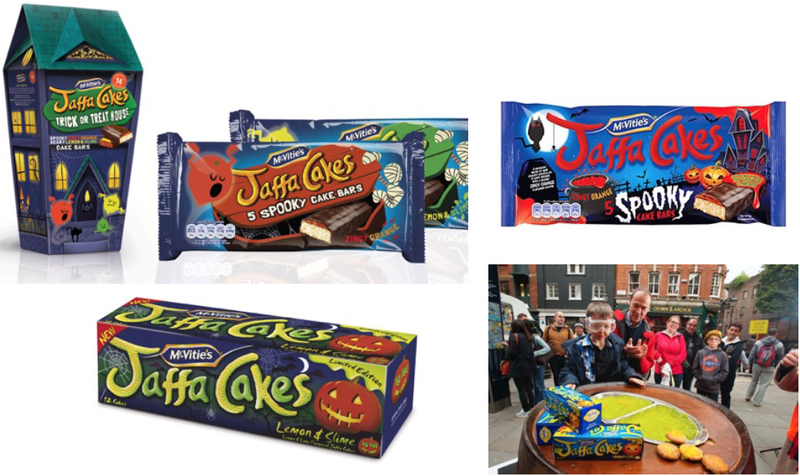 McVities Jaffa Cakes has a long tradition of getting stuck into the Halloween spirit, perhaps helped by the fact that its gooey jam filling does a passable impression of congealed slime or blood (in a good way!) This year they’ve supplemented the usual fancy-dressed packaging with an innovative ‘Trick or Treat House’, cleverly engaging in a sharing party moment. Searching the archives I came across an interesting brand activation, where kids in scuba masks were encouraged to dunk their faces into a barrel of slime and pick up hidden Jaffa Cakes with their mouths. Quite how that went down with environmental health officers is not clear, but I can understand why they aren’t repeating it. Nice as the McVities house is, it’s totally trumped by the same idea from Hotel Chocolat. Ok, it’s holding £8 worth of exquisitely moulded skull, gravestone and cauldron-shaped chocolates, but it didn’t cost much more to design the box in a delightfully lop-sided, leaning-forward, ready-to-collapse kind of way. There are some brands whose brand stories naturally overlap with that of a frightening supernatural fantasy. Monster energy, for example, probably couldn’t look more like a Halloween edition than it does all the time. The same can be said of Hobgoblin, the characterful beer brand of Wychwood brewery, who claim the title of ‘the unofficial beer of Halloween’. The brand also brews a special edition Pumpkin beer called ‘Pumpking’, with an especially scary-looking anti-hero lording it over the packaging. Now we’re getting somewhere! Hobgoblin is perhaps the perfect Halloween brand, its very reason for being totally centred on a world of scary fantasy creatures, led by the eponymous king of the Goblins himself. This year the brand has created a series of mock-horror movies – Frankenstein, The Fly, The Exorcist and Psycho will all be given the Hobgoblin treatment with the ruby beer taking a starring role in each of the short films. Viewers can vote on the the final film that Hobgoblin should star in, in a digital media campaign that is aimed at recruiting and engaging the next generation of fans. According to Marston’s Chris Keating: “Over the last two years we’ve more than doubled the number of 18-34 year olds who engage with us on social media, and our aim for this Halloween is to engage with 1 million consumers through social content”. But whilst Hobgoblin already has the perfect platform for any Halloween activity to be ‘on brand’, there are plenty of ways in which other brands could get more much-prized consumer engagement. Clearly experiential and digital content is perfect fodder for this, but packaging remains a powerful ‘media’ tool that can, through its secret superpower of sensation transference, add a lot more to the story. 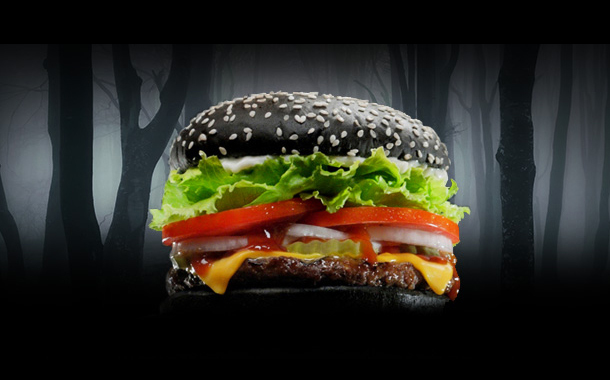 Now, I must pop over to Burger King to see if they remembered to sell this beauty in a suitably ghoulish box. Or should that be a coffin?